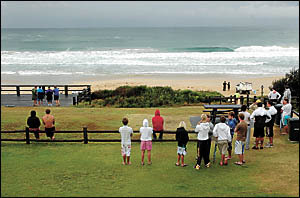 Family and friends of a missing 18-year-old surfer maintained their vigil on a wind-torn Sawtell Beach yeaterday. ALL they could do was look out despairingly at the water, huddled together in the rain, hoping and praying. Anxious family and friends maintained their vigil at Sawtell Beach yesterday as the search continued in bleak conditions and big seas for a missing bodyboarder. The Bonville 18-year-old ? an experienced surfer and good swimmer ? was catching waves on Monday afternoon, like he usually did, with a group of friends in front of Sawtell Surf Club. The teenager, who wore a wetsuit and flippers, was last seen riding a wave in pounding surf. When his board ? which did not have its legrope attached ? washed ashore at 4.45pm, Coffs Harbour City Council lifeguards, who were wrapping up their patrol for the day, raised the alarm. Senior lifeguard Sonny Tisdell hit the waves in his jetski as the search began in earnest. Other lifeguards in inflatable rescue boats (IRBs), Sawtell Surf Club lifesavers, Coffs Harbour water police and a Westpac Lifesaver Rescue Helicopter crew looked for the man until dusk. The search resumed at first light yesterday, with jetskis, IRBs, Volunteer Rescue Association personnel from Woolgoolga and Nambucca Heads, the police air wing and a water police vessel deployed to scour the ocean off Sawtell Beach, Boambee Beach and Bongil Bongil Beach. 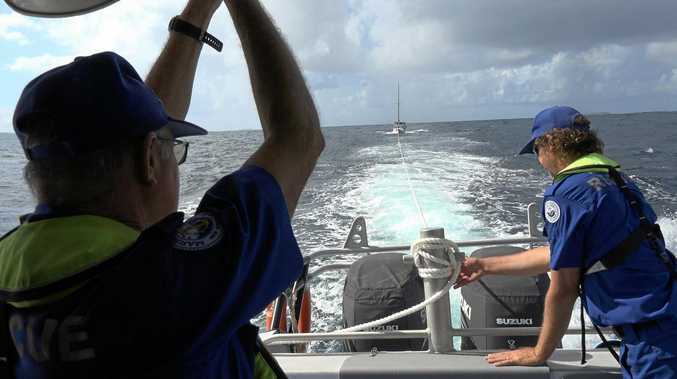 Surf club crews, the man's family and friends and other searchers also checked the shoreline, and observers were in place on Sawtell Headland and Boambee Headland. Mr Tisdell said the conditions at Sawtell when the man disappeared included a swell of up to two metres, an incoming tide, shallow sandbanks and rips. The surf was just as big yesterday. Emergency crews continued their search until nightfall and were expected to resume at dawn this morning. Friends described the missing bodyboarder as a 'vibrant and likeable fella'. "He's one of the nicest guys I've ever known," one mate said. "I don't think there's anyone who doesn't like him." The man's family asked yesterday for his name not to be published.